Sometimes the fog of war and the din of battle are too much. Sometimes alien invasions are more than a person can handle. A person can only stop a world-wide spread of a disease so many times before needing some rest and relaxation. When world saving games and battling ancient evils gets to be a little too much, there’s always the Mascarade. Hide behind your mask, bluff your friends, and collect the gold. In Mascarade you take on the role of a guest at a grand party and, using your wit and wiles, try to collect thirteen gold coins before the other guests. There are three potential sources of gold in the game. The courthouse, the bank, and other players. Each character has a unique ability that helps or hinders the flow of gold. The catch is that nobody, even you, can really be sure who you are. The standard rules for Mascarade are designed for groups of four to thirteen players, but two alternate rules sets allow play by two or three players, respectively. While the special rules for smaller groups are not terribly complicated, Mascarade is best learned by groups of four to six players. Advanced gamers may be more comfortable diving into a two or three player game, however, and are encouraged to give it a try if so inclined. Regardless of the group size, the game begins with each player receiving six gold. Each player also receives cards that identify their initial characters. This is the only time everyone can be sure of anything. In the standard version of the game, each player only receives one character card. In the three player version, each player receives two character cards. In the two player version, each player will receive three character cards. Once all characters are identified, players turn their cards face down. It should be apparent why the smaller games become more complicated, but don’t let that turn you off from giving it a try. Small games of Mascarade can be some of the most challenging and exciting fun you may have at the gaming table. Players may use any combination of characters they like for play, though the rules include a chart showing the best character combinations for groups based on size. The chart provides suggestions based on which combinations are easiest for groups to learn the game, but after players are comfortable with the rules and flow of the game, they may substitute character cards as they see fit. The only exceptions are that the Judge must always be in play, and the Peasants and Inquisitor characters require eight or more players. It is recommended that at least one third of the cards in play be characters who are able to draw gold directly from the bank. The game can be played even if this suggestion is not applied, but game play becomes slow and clunky. On each player’s turn, he may take one of three actions. A player may pick up two character cards and hold them under the table, then either swap or pretend to swap the cards. He may instead choose to look at the card in front of him. Finally, a player may choose to announce his character- or rather, the character he believes he has- and activate that character’s ability. If the player is unchallenged in this last action, the player performs the character’s action and the round progresses to the next player. If the player is challenged by another player claiming to have the named character card, both players reveal their characters. The player with the named character immediately uses the activated ability, while the other player must pay a fine to the courthouse. Each character in the game has a unique ability that fits the theme of the character. The Judge is able to collect all gold at the courthouse. The King simply claims three gold from the bank while the Bishop claims two gold from the richest player at the table. Other abilities include swapping the cards of other players, trading gold with other players, and forcing another player to announce his character and then reveal the card with a steep penalty if the targeted player is wrong. With so many abilities represented in the game, no playthrough will be quite like any other. 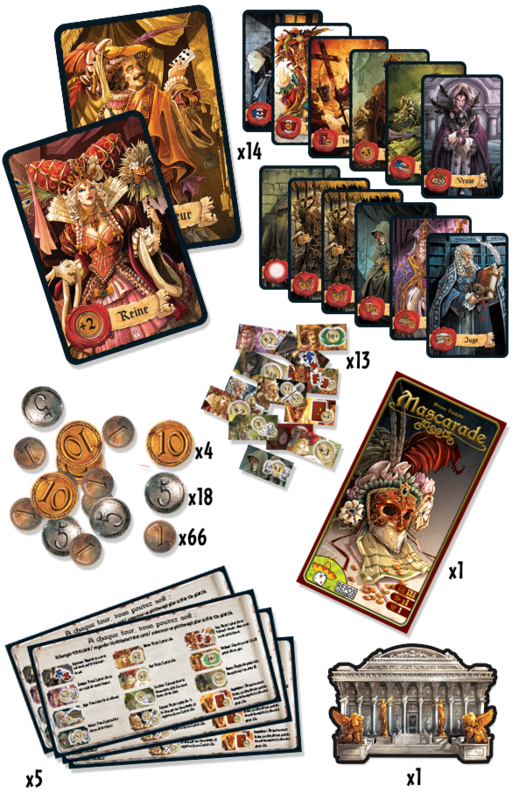 Mascarade comes with fourteen beautifully illustrated character cards, a courthouse board, a collection of gold coin tokens, fourteen character tokens, a rule book, and five game aid cards. One of the character cards is “blank,” in that it has a character but no assigned ability, allowing the game owner to assign a unique ability of his choosing. Each component is well crafted and easy to identify at a glance. The only thing that seems to be missing is a storage option for all the tokens, but this is easily handled with two ziplock bags. Mascarade is easily one of the most visually pleasing games in its genre. Each card is masterfully illustrated, with the character art also featuring on the character tokens. The courthouse board is simple in design, but gives the impression of high society, aristocracy, and classical architecture. Even the game aid cards are nice to look at and simply designed, making it easy to review the actions one may take or double check what any given character’s ability is. 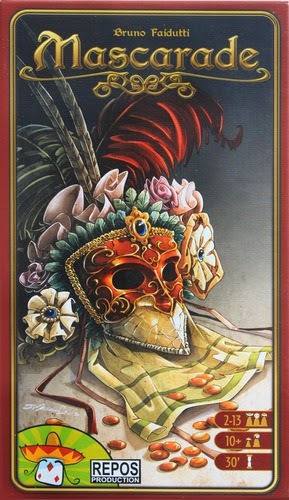 The art is no less impressive on the box, with a classical Venetian inspired masque and gold coins drawing the eye. Though the art leans more toward modern illustration rather than classical styles, it would not be a surprise to find art of this sort on the wall in someone’s home. As an added bonus, the waxy, slick texture we find on so many game boxes today is replaced by a more pleasing texture. If you’re on a budget but want to pick up a fun game, Mascarade is definitely worth considering. Those with a sharp memory will excel, as will those who are good at bluffing. Even players who don’t have the keenest memory and can’t win a single hand of poker can have fun with this game with a little clever misdirection. The game was released in 2013 and has held up well. An expansion is also available, introducing thirteen new characters to bring to the ball. Devon is a stay at home dad, photographer, and aspiring writer. You can find him hanging out with the DFW Nerd Night crew or wandering around Ft Worth with his camera. Drop him a line at @MrEnkidu on Twitter or come to a DFW Nerd Night event and say hi.